Copies of the Super Aramith® Pro ball set are appearing in the market. While we are of course flattered to have our designs so closely copied, this is a blatant attempt to leverage the good name and recognizable appearance of the Aramith® Super Pro ball in the marketplace. Unfortunately, the resin used in these balls connot compare to the Aramith® resin and there are fillers used in these balls as well. Therefore, while they may look like the Aramith® Super Pro balls in the beginning, they cannot match the performance and longevity of the Aramith® ball. Insist on Aramith® for your best play!! Withstands over 50 times more impacts and is far more scratch resistant than other balls. Resists at the friction temperature of 482°F/ 250°C when the ball slips into motion! + No flat spots on the ball! The unique elasticity of the Aramith® phenolic resin is calibrated for optimal rebound which allows a perfect control of every shot. The perfect homogeneity of the material in Aramith® plain balls as well as in numbered balls guarantees perfectly true and accurate roll. Professional players and federations worldwide have exclusively selected the Aramith® balls. Iwan Simonis® is a registered trademark of Peltzer & Fils S.A. 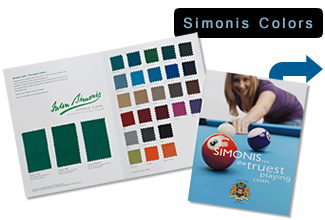 The Cloth of Champions® is a registered trademark of Iwan Simonis, Inc.
All images and content contained on this website are copyright ©2019 Iwan Simonis Inc.
Use without express permission is prohibited.